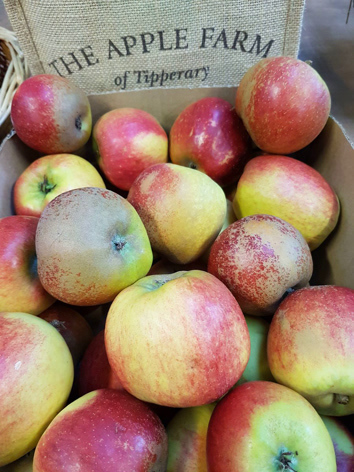 This week The English Apple Man highlights an Irish Apple grower in Tipperary + an update on harvest worker availability. Last week The English Apple Man looked at the challenge of procuring enough harvest labour in New Zealand. This week the subject is another Island closer to home. As a regular follower of Twitter The English Apple Man became aware of another 'tweeter' with a passion for fruit growing. Cornelius Traas from Tipperary who regularly tweets on apple related subjects!! Cornelius Traas (or Con as he is often known) has been involved in growing apples for most of his 50 years, having grown up on a mixed farm in Ireland with quite a lot of fruit from an early age. Con's parents moved from Holland to Ireland to grow fruit, and the first crops planted were strawberries and apples. Over the years the farm expanded, and Con now grows about 40 acres of apples, 4 of plums (mostly Opal), 3 of strawberries; about half under protection, as well as raspberries and cherries (also in tunnels). Con went to university in University College Dublin, where he studied horticultural science, and he recalls his seven years there fondly, not least the three months he spend at Luddington EHS in Warwickshire, working on vegetables. After finishing a masters degree on fruit storage, Con began lecturing in a number of colleges and universities, and indeed to this day he still works (part-time) in the educational sector, at University of Limerick. Simultaneous with his university occupation, Con went to work on the farm, and took it over in 1994, adding the additional fruit crops, and expanding the orchards, as well as adding a fruit-juicing company, which nowadays makes about half a million bottles of juice and similar drinks per year. His latest additions are cider vinegar and small-scale apple crisp making, though his real love is still in the field. He says there is nothing he likes better than harvesting a crop of great-tasting fruits, knowing that customers will be happy with them. Given that a lot of the fruit (as well as other products) are direct-marketed from the shop on the farm, he has the satisfaction of meeting plenty customers. As well as his activities at work and on the farm, Con is currently chair of the Irish Apple Growers Association, and also the Tipperary Food Producers Network. He is married to Trina, and has three children; Daniel, Ella and David. Clearly Cornelius is a dedicated champion of the environment and this is eloquently demonstrated in one of the many thought provoking passages on The Apple Farm website. "As everyone knows, forests and trees are of vital importance to the world's ecosystem, especially in their role of removing carbon dioxide from the air, and producing oxygen for animals and humans to breath. But do you know that apple orchards serve our environment in exactly the same way? In fact, an acre of apples will extract about 15 tons of carbon dioxide from the air each year, and produce 6 tons of oxygen too. So if every person in Ireland were to eat an apple a day, think how much good it would do to the environment. 20,000 acres of apples would be required to produce the annual apple requirement, and this in turn would remove 300,000 tons of carbon dioxide from the air, and replace it with 120,000 tons of oxygen. Or, to put it another way, for every apple you eat, the apple tree is producing about 1 hour's oxygen supply for you as well, and this, of course, is free of charge". "For anyone who has purchased our apples at any time beyond October, you are probably aware that they are kept in refrigerated stores to keep them fresh. Running these stores requires a considerable amount of electricity, as does the operation of our electrical fork-lift, and various other electrical machines on our farm. With the environment in mind, we have therefore switched to Airtricity from ESB. This switch means that we are now using wind-generated electricity for all aspects of our business, and that anyone purchasing our produce can be satisfied that it is being produced in the most environmentally-constructive way". "On our farm we pasteurize our juice using hot water. Up to now, we have been using gas and electricity as our source of hot water, but we have recently added solar energy to this mix. We have installed Thermomax solar water-heating panels on the roof of one of our farm buildings, and a special enlarged hot-water tank to maximise the efficiency of the panels". 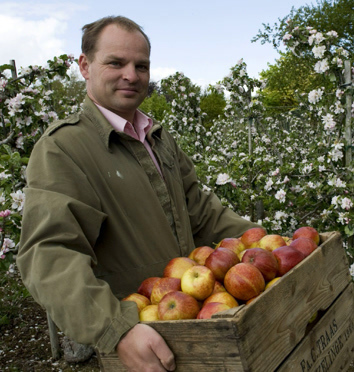 Cornelius Traas is Chairman of The Irish Apple Growers Association and prominent in promoting the Irish apple industry. "Irish consumers want to eat Irish apples, and are continually "disappointed that they can't get Irish apples in their local supermarkets". So says Con Traas, Chairperson of the Irish Apple Growers Association. "Consumer demand is more than adequate," he says. In what is a small seasonal sector, one of the biggest historical problems the association's 40 grower members face is in dealing with multiple retailers who want to treat them "as if they were buying items from a factory where output volume is easily controlled, and plannable in advance," says Traas." Supermarkets want guaranteed price tenders, "before a grower will even know what their crop will be like that year. Then if the grower is short, he or she would have to buy to make up the shortfall, but because there are so few growers, this might not be possible." But the good news is that the future looks rosy for Irish apples. 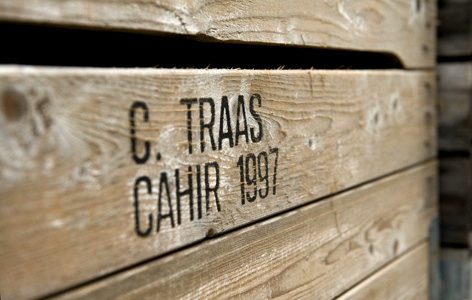 "In terms of flavour and texture, the quality of Irish apples has never been better," says Traas. Today's growers are exploring alternative routes to markets. In recent years, there have been a growing number of producers developing innovative and award-winning apple-based products, from Longueville's apple brandy to various import substitutions such as Llewellyn's apple balsamic vinegar and Highbank Orchard Syrup, an apple-based alternative to imported maple syrup. These may remain niche products, says Traas, "but still require quite a volume of apples to make, and they also raise the profile of Irish apples and Irish apple producers." What is having the most impact for growers has been the expanding craft cider market. "The craft ciders sell at significant volumes, and because most of them use close to 100 per cent apple, they have the ability to take a lot of apples produced in Irish orchards," says Traas". One of the UK's top fruit growers fears it will not have enough EU seasonal workers to harvest its crops because of Brexit. KentOnline reports news from A.C. Goatham & Son, the UK's largest producer of apples and pears. 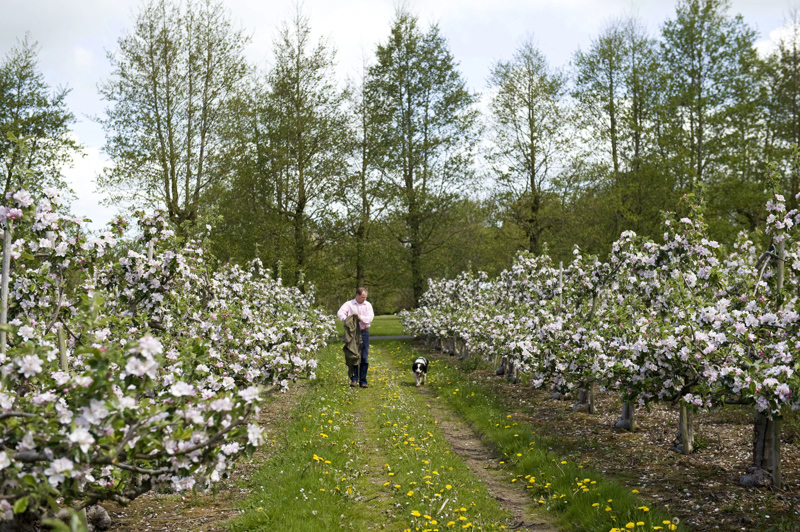 Goatham has 2,650 acres of orchards across Kent and the business contributes more than £13million to the Medway economy. About 600 pickers are recruited each year working on 28 farms, but a government trial is limiting the number to 2,500 workers for all farms in the UK. 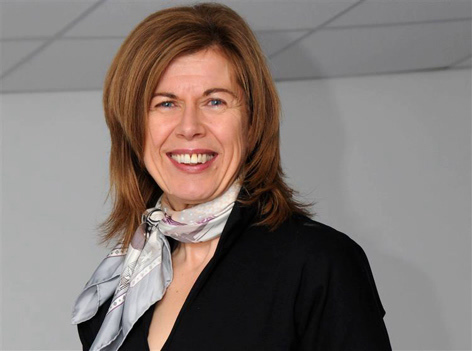 Goatham's commercial director Carol Ford said: "We have been working hard behind the scenes and have plans in place in case of a no-deal Brexit. And finally this week; a reminder of how reliant we in the UK are on imported food! Most Western countries don't have to think too much about their level of food self-sufficiency. Established trade relationships with countries around the world mean that any deficit at home can be easily, swiftly, and usually cheaply compensated via imports. For the UK though, currently facing the very real prospect of a hard or no deal Brexit, complications in trading with the EU and other countries, coupled with vastly increased customs processing times, could lead to shortages, the National Farmers' Union has warned. 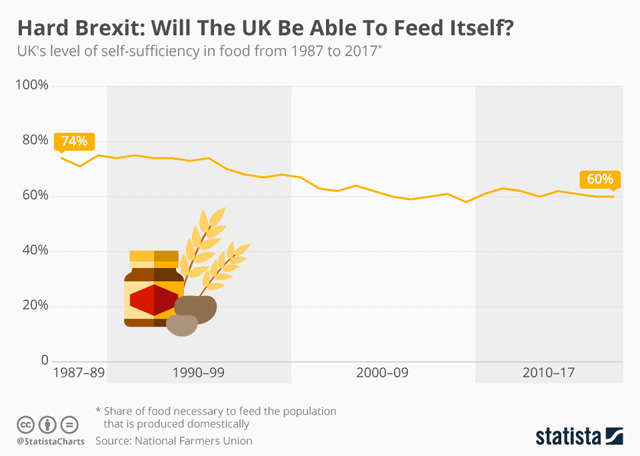 Currently, the UK produces only 60 percent of the food it needs to feed the population domestically. As our infographic shows, this is a marked decrease on the level of 74 percent seen in 1987. Food is of course not the only sector which could face shortages. Pharmacists warned this week that they are already experiencing a surge in shortages of common medicines, coupled with "vastly increased" prices. The chart shows an increased dependency on imported food since 1987 dropping from 74% to 60% today. The British fruit growers have bucked the trend by increasing the supply of home grown apples, pears, cherries, strawberries, raspberries and blueberries. British soft fruit (strawberries, raspberries & blueberries) now represent a retail value of one billion pounds sterling and 'home grown' availability from April to November. As an industry, we've seen demand for British apples increase over the last 20 years and have invested in new, highly productive orchards and innovative equipment to improve efficiencies. 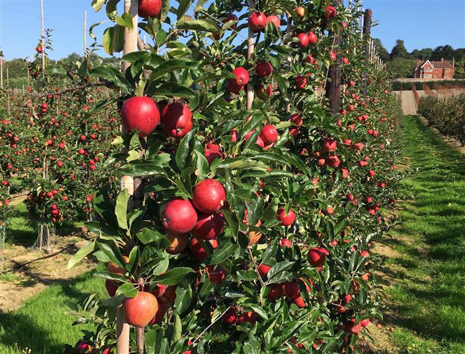 British apple & pear growers have invested in modern varieties grown in intensive orchards with circa 3,500 trees per hectare. Click on ENGLISH APPLES & PEARS for extensive information about British Apple & Pear production. That is all for this week - next Tuesday The English Apple Man will be attending the East Kent Fruit Society AGM and Dinner - next Friday the Journal will cover elements of the meeting and particularly the EKFS Orchard Competition Trophy presentations.